In what all athletes and coaches hope was the last indoor meet of the season, the Roughriders used 42 personal records (PR’s) and 6 season records (SR’s) Saturday to earn the team victory in the GF Class B Invitational. 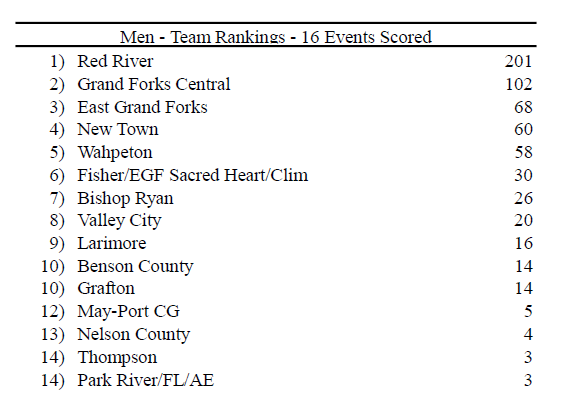 The meet featured a collection of mainly area Class B teams, although it also pitted athletes from GF Central, Wahpeton, and Valley City in Class A, as well East Grand Forks and EGF Sacred Heart/Climax-Fisher in Minnesota. Teams from Minot Ryan and New Town also made the trek, providing athletes the chance to compete against unfamiliar competition. Senior Zack Topping, the top returning short sprinter for the Riders this season, was the top event winner Saturday. He won the 100 (11.64) and 200 (24.15), as well as lead off the winning 4×200 relay team. Both his sprint times were SR’s. Junior Keandre Anderson came out for track in 9th grade for a little over one week, then quit the sport. Everyone, including Keandre, is glad he came back out this year. Anderson continued his impressive season Saturday, scoring 24.5 points, which was tops on the team. Anderson placed second in the 300 hurdles (43.27), second in the 200 (24.31), third in the 60 hurdles (9.74), and ran second-leg on the first place 4×400 relay team. For the first time in 2019, RR had five athletes hit the 40’ barrier in the shot put. Leading the charge was event-winner and senior captain Brett Klefstad (47’8.5), who has placed 1st or 2nd in three meets this season. At the State Indoor, he placed 5th. Senior co-captain Cade Johnson made the biggest gains, placing 4th and reaching 44’7, a PR by over three feet. Fellow senior Luke Anderson was 5th at 41’9.5 (SR), with junior Cole Ogren in 7th (41’0) and sophomore Tyler Larson in 8th (40’7.5). Saturday marked Larson’s first time over 40’ and his first-ever varsity points. Look for big things with him and the rest of the throwers after heading outdoors this coming week. Junior Bryce Enerson made the 60 hurdles look easy Saturday, winning the event in a SR of 8.91. After sickness hampered his performances the past two weeks, he looks primed for a big surge in the outdoor season. Also finding his form was junior Tanner Bernhardson, who managed two PR’s in the 60 hurdles (10.15-4th) and 300 hurdles (45.01-3rd). A shout-out to 8th-grader Lukas Heydt, who scored his first varsity point of the season by placing 8th in the 300 hurdles (47.97-PR). The race was redemption for Heydt, who stormed to a huge lead in his heat last week before hitting a hurdle and falling. Senior newcomer Cheyenne Hare turned heads Saturday in the 4×2, clocking a 23.2 split. The mark is the second-fastest achieved for the Riders this season. He also placed 3rd in the 200 (24.36-PR) and 4th in the 100 (11.86-PR). It was a strong meet in Hare’s family, as his cousin Marcelles Sartwell also posted excellent marks and one of the team’s fastest 4×4 splits. With Hare owning family bragging rights in the 100/200 and Sartwell reigning supreme in the 400 and up, the most pressing question now becomes, when will these two run a 300 for the title of, “Family’s Fastest”? For the second time in a week, junior Kaden Rohloff won the pole vault. After clearing 13’6 last week, he managed 12’6 Saturday to clinch the victory. He moved the bar to 13’3 and just missed on three attempts to close out the competition. Despite missing a number of athletes due to prior commitments or a focus on individual events, the Riders still posted strong times in the 4×200, 4×400, and 4×800. The 4×200 team placed 1st in 1:36.44 with four different athletes than the RR team that placed 5th at EDC in 1:36.22. Team members included Topping (24.1), Nate Hollingshead (24.9), Hare (23.2), and Enerson (24.2). The 4×800 team of Dameon Zenawick (2.10.9), Jeff Corcoran (2:17.9), Mohamud Yahye (2:11.9), and Gavin Dorsey (2:17.3) all posted PR or SR splits to place second in 8:58.07. As in the 4×2, depth was the story here as all four athletes were not on the EDC 4×8 team last week. On the B-team, sophomore Erik Stokke posted a nice PR (2:25.8), with fellow sophomore Dylan Narum making his 4×8 debut at 2:30.6. In the 4×400, the team of senior Nate Pressnell, Anderson, Jake Arason, and Sartwell placed first in 3:39.09. Despite the busy day from Sartwell (featured below in the Dorsey Run-Down), he posted a huge anchor leg in 53.8. Pressnell (56.4), Arason (55.0), and Anderson (53.8) also ran solid legs in the victory. Red River fielded seven 4×4 teams Saturday, with 21 of 28 athletes matching/reaching PR’s/SR’s. After originally being slated to be a Class B and JV meet, the coaches made the decision to open the GF Indoor meet to Class A Varsity athletes to compete in as well. Both the boys and girls teams dominated the meet, scoring 201 points and 201.5 points, respectively. The boys team scored at least one athlete in every event, including 8 athletes and 2 relay teams placing in the mid-distance and distance events. Red River started off the day strong, placing 2nd and 7th between the two 4x800m relay teams. The 2nd place team of freshman Dameon Zenawick (splitting 2:10.9), senior Jeff Corcoran (2:17.9), senior Mohamud Yahye (2:11.9), and junior Gavin Dorsey (2:17.4) all PR’ed in their 800 splits, running a total time of 8:58.1. Their time is the second fastest 4x800m time RR has run this year, trailing only the school record time set last week. The second 4x800m team of 8th grader Jake Jenkins, sophomores Erik Stokke and Dylan Narum, and junior Rawley Lachance also placed 7th in the event. The 1500m run had three placers from Red River. Senior Jake Arason, the team’s leading point scorer, placed second with a personal best time of 4:14. Arason also won the 800m run with an open best of 2:03.4. Not far behind Arason in the 1500m was teammate Zach Simon. After posting a personal best of 4:51 in the 1600m last season, Simon placed 4th with a 4:16 in the 1500m this weekend. 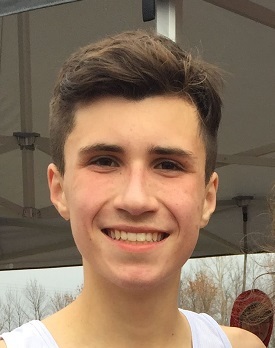 Translated to a 1600m, the time is only half of a second off of the state-qualifying mark and over 15 seconds faster than his best last season. Sophomore Mustafe Abdi also had a great day on the track, setting PRs in his 1500m, 800m, and his 400m split in the 4x400m. 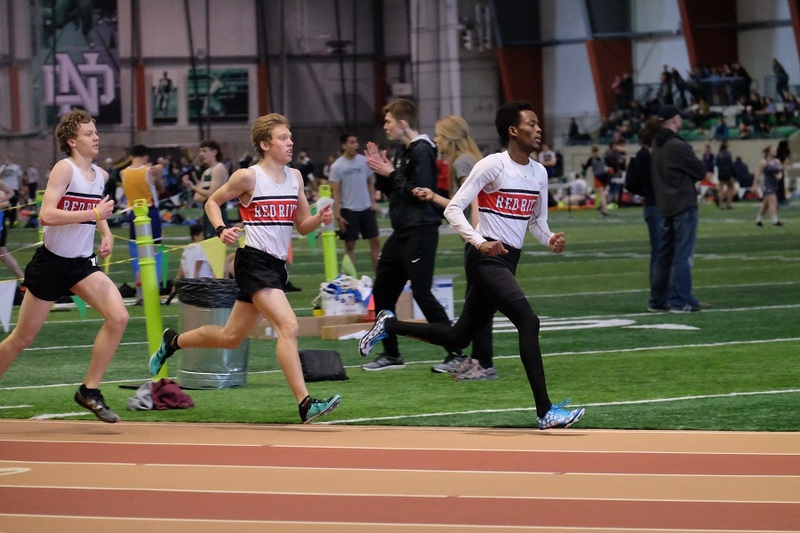 After starting his season at a 2:20.5 in the 800m, Abdi significantly improved down to a 2:05.5 on Saturday, good enough to place 3rd overall. He also placed 8th in the 1500m at 4:28.3 and ran a blazing split with a personal best of 55.5 leading off his 5th place 4x400m team. Senior Marcelles Sartwell rounded out the placing 800m runners, finishing 4th in 2:07.9. In the final distance event of the day, freshman Hunter McHenry placed 5th and 8th grader Matt Rongitsch placed 6th in the 3000m. This capped of a great day for RR distance, which scored 52 points across four events. Many athletes hope to officially state qualify when the snow finally melts and the outdoor season can start. Next up for the Riders is the Dual vs. GFC on Friday, April 12th. This is an outdoor meet. If the snow doesn’t melt in time, this meet will be postponed to a later date. Stay tuned for updates.